Across the banking industry, 1.2 million jobs are expected to be affected by AI. Bank of America already has cut the number of employees across the bank to 209,000 at the end of 2017 from 282,000 at the end of 2011. Going forward, the number of employees in will (not) necessarily decline further. The nature of those jobs will change. While some roles will be automated, new jobs will be created to analyze and oversee the automated processes. Bank of America doesn’t want employees to worry that its new virtual assistant, Erica, will change or eliminate their jobs. It wants them to prepare for that to happen. Erica made its debut this year as one of Bank of America’s highest-profile efforts to use artificial intelligence. Responding either to speech or text commands, Erica helps customers perform basic banking tasks, like locking a missing debit card or finding routing numbers. But while the virtual assistant—the first to be offered in a large U.S. lender’s app—is intended to bolster the customer experience, such innovations pose a threat to existing jobs. To help workers cope, Bank of America recently launched a set of online courses to train them for new and evolving roles in the company. About three years ago, Chief Operations and Technology Officer Cathy Bessant realized that technological changes were fundamentally transforming the nearly 95,000 jobs in her unit, she says. 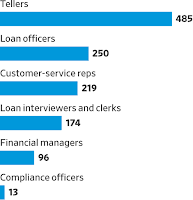 Her division consists of staffers who build and run the digital tools that underpin the bank, as well as employees in call centers and loan processing. Some of those jobs will go away, Ms. Bessant says, while for others, new roles and responsibilities will emerge. Across the banking industry, 1.2 million jobs are expected to be affected by AI technologies like Erica, according to a 2018 report by Autonomous Research. Such tools will allow many employees to do their jobs more efficiently, the report says. But thousands of others will find their roles eliminated. Technology has already changed the nature of work in the banking industry. Many customers, for instance, now perform routine tasks themselves, such as depositing checks digitally instead of visiting a branch. 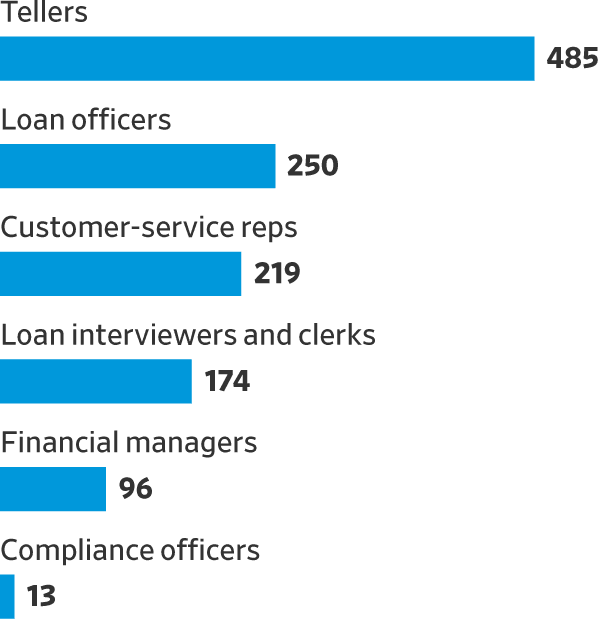 In response, Bank of America and others have minimized the role of tellers and boosted sales staff in branches. AI is expected to continue to affect customer-service roles such as tellers, the Autonomous report says. Ms. Bessant believes cheap, high-speed computing power means technological change in the industry has now escalated to a pace rivaling the Industrial Revolution. Tasks that involve “routinizable skills that don’t add customer or company value” will be automated, she says, and tools like Erica will allow customers to get help quickly without a human intermediary. The Charlotte, N.C.-based bank already has cut the number of employees across the bank to 209,000 at the end of 2017 from 282,000 at the end of 2011. Going forward, Ms. Bessant doesn’t think the number of employees in her unit will necessarily decline further. Instead, she says, the nature of those jobs will change. While some roles will be automated, new jobs will be created to analyze and oversee the automated processes. The new online courses—dubbed GT&O University—are part of an effort to make the transition go as smoothly as possible. The online training, which was rolled out in late April, grew out of the bank’s desire to train employees for those new jobs and the “very real and day-to-day need for people to stay motivated about working here,” Ms. Bessant says. The courses are available to workers in Ms. Bessant’s global tech and operations unit. Employees can choose from classes in four “colleges” encompassing basic banking skills, technology, operations and leadership. Within each college, employees can pick different topics and sit through beginner, intermediate and advanced training. The topics currently have about 20 to 30 hours of content each, and include AI and various coding languages. There are also courses on the bank’s efficiency initiative known as “operational excellence.” In these popular classes, employees learn to document and measure clients’ experiences, for example. The courses are optional, but the bank says they have already been taken more than 20,000 times. The bank says course completions in relevant subjects are starting to become a factor in internal job applications.